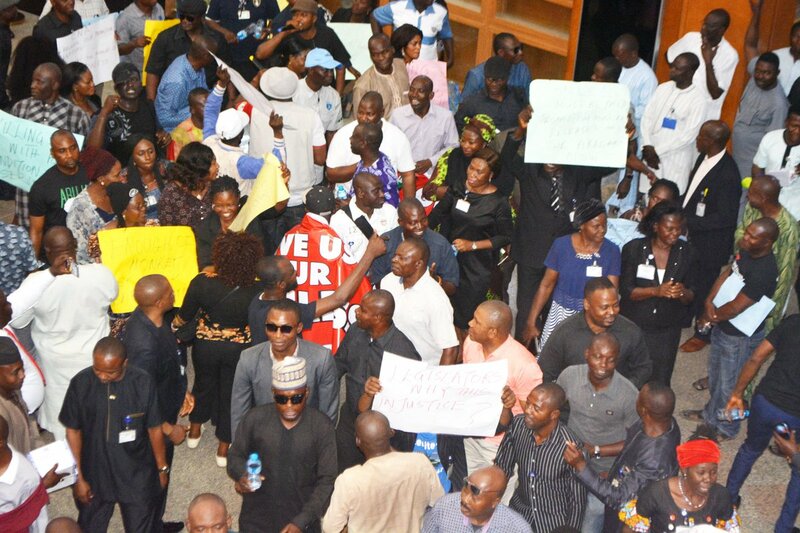 Members of Parliamentary Staff Association of Nigeria (PASAN), protested to disrupt activities at the National Assembly. 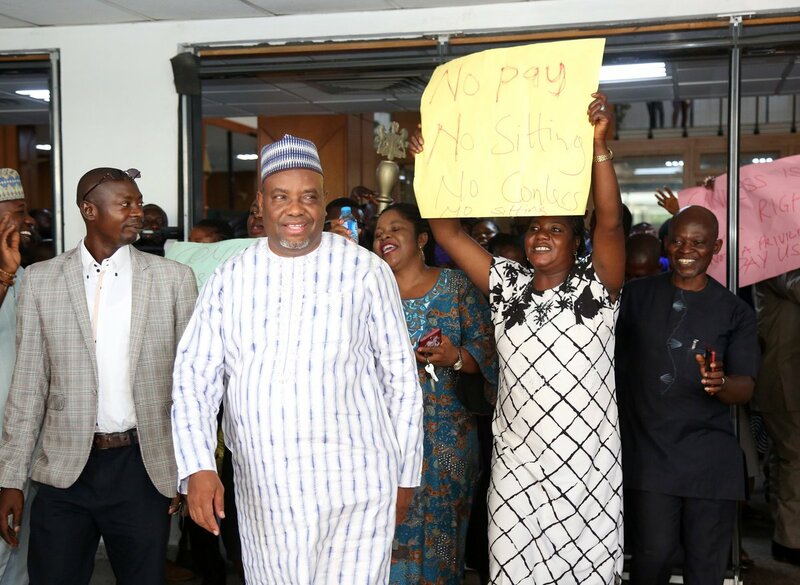 The workers had at the weekend threatened to picket the National Assembly over claim of non-payment of salary and allowances. The protesting workers took over the National Assembly lobby chanting solidarity songs as they displayed their numerous plea cards with various inscriptions. 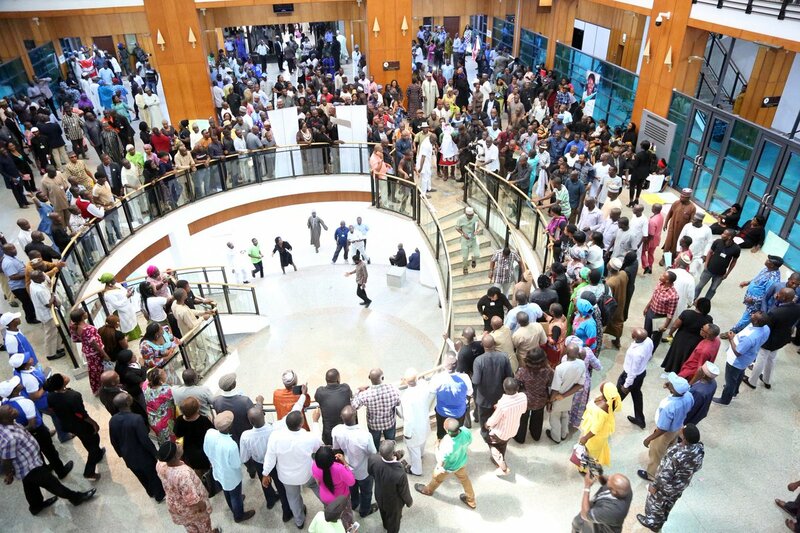 The two chambers of the National Assembly were barricaded thereby stopping Senators and House of Representatives members from accessing their offices including Senate President, Bukola Saraki, Deputy Senate President, Ike Ekweremadu, Speaker House of Representatives, Yakubu Dogara and his deputy Lasun Yusuff. The Clerk to the National Assembly, Mohammed Sani-Omolori, however insisted that the protest was uncalled for especially when the demands of the workers were being treated. The workers vowed to continue the protest until Sani Omolori was removed from office. PASAN issued a statement at the weekend to alert the National Assembly management of its planned protest scheduled for three days beginning from Tuesday (today). “We will not rest on CONLESS until we receive alert. Omolori must go,” the workers chanted. When Saraki succeeded in paving his way to address the protesting workers, he assured them that the leadership of the National Assembly would meet management to resolve issues at stake. The senate president assured that the two chambers would take steps to fast track the passage of the Condition of Service for National Assembly bill and further pleaded with the workers to call off their protest as their demands would be met. Ahmed Lawan, the senate leader said that the protest was not against the leadership of the National Assembly but against the management. Sani-Omolori on his part said: “It is a matter that has been on for some time now and we have tried to explain to them; we approved salary increase for them which was captured in 2018 budget but as it is today, it is a common knowledge that the level of implementation of the 2018 budget, especially the new addition to the National Assembly, which has not been implemented – that is where we had hoped that the addition would be paid. “So, to the extent that the money has not been released there is no way we can make the payment. “We told them it is wrong and we tried to prevail on them to try to see through things in the correct way. As a matter of fact, I wrote a letter to them and I also had series of formal and informal consultations with their leadership up till yesterday (Monday) to make them back out of what is clearly an act that is not in tune with their own rules. When Asked if he is worried by the action of the workers, Omolori said: “I am worried that in an institution that you think people should be able to look at things properly and then they are not looking at it that way that is why I am worried. “I still insist that they need to be a bit patient with the system. Like I said, in my reply to them; in an unprecedented manner, the presiding officers acceded, without hesitation to their requests for this increment. It was bargained with them and they captured it in the budget.